Is there any way to automatically narrow tracks between pads? You have drawn a track that is 15 mils wide that goes between some component pads that are 20 mils apart. If you select the track and edit it to make it 20 mils wide it now is wide enough to touch both pads. Obviously you can manually add track segments to make the track narrower between the pads. Is there any way to make KiCad automatically make the track narrower between the pads? While drawing a track you can use the right mouse button and click on “Select Track / Via width” to change track widht while drawing tracks. If you look at the hotkey shortcuts there are also some track related keys I have not used yet. Did a short experiment, pressed “q” while drawing a track, and you can type in a new with to continue a track with. I do not know what the “w” and [Ctrl + W] do. 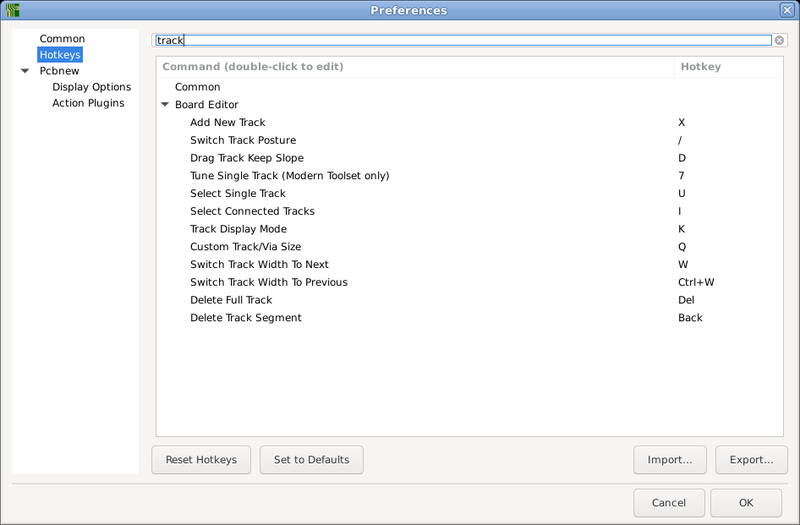 Those two hotkeys allow to move up (w) and down (ctrl+w) within the list of predefined track widths.
" W " and [Ctrl + “W”] did not do anything for me, so it was time to poke a little bit deeper. I found an empty list of “Pre-defined track and via dimensions”. The list was empty, so I filled in 0.3mm, 0.8mm and 2mm, and after closing the window started a new track with X. Now W and [Ctrl + W] do indeed switch between the pre-defined track widths in this list. This list always appears to be empty on new projects. How is the new project supposed to know what track widths, and via sizes it should line up. In any case you found it. That’s what counts. Having a list of pre-defined tracks with 30% inrements or so would at least have the W and [Ctrl+W] keys do “something”, which would make it easier to use for new users. Also, pressing “w” a few times in a row to get to fat tracks is a pretty intuitive way of working. I also find it (very mildly) dissapointing that “W” and [Ctrl + W] do not work when you select a track or net. All this is low hanging fruit and may already on some wish list. Just a few days ago I got an launchpad account, and there seems to be some kind of voting system there. I may take some time to go through wished features and drop some votes over there. Definitely. Starting with 5.1.1 (coming soon), and obviously in the current nightly builds (5.1 and master branches). How is the new project supposed to know what track widths, and via sizes it should line up. In any case you found it. What Fab House are you going to send the Gerber Files to? KiCad can not in any way know where you are going to send your project files to. You have to know the Design Rules of the Fab House that you are using before you enter any DRC information into KiCad. OY! So much wrong with this statement. New Users need to read the manual; and possibly be willing to explore the software a little bit before complaining. Have been using this lot and been quite happy so far. Misinterpreted your post I first replied to. Which version are we talking about? I’m using 5.0.2 and can’t find this menu item. 5.0.2 has this under setup. 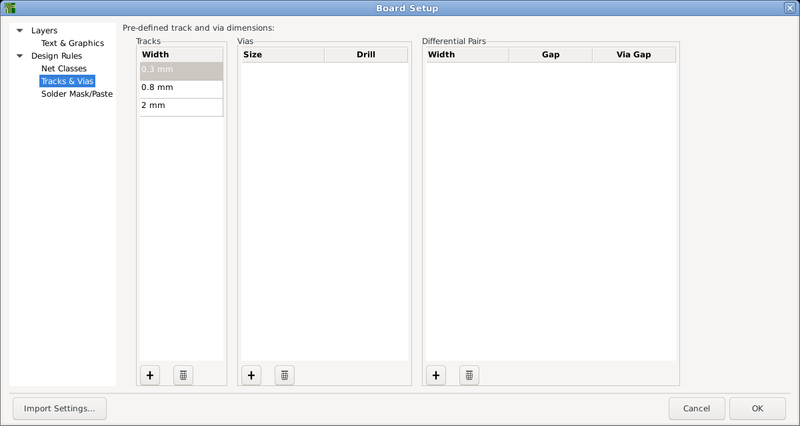 And yes 5.1 was a complete gui overhaul so be prepared to learn a new software.